This category includes both fiction and non-fiction titles dealing with war. Verreault has a master’s degree in translation from Université Laval in Quebec City and lives in Lévis with her Italian husband and their triplets. She has published three novels in French. Behind The Eyes We Meet is the English translation of L’angoisse du poisson rouge, her first novel to be translated. The translator is Arielle Aaronson. 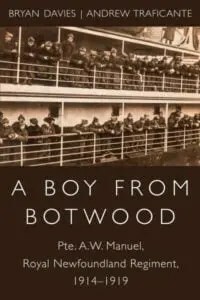 Since it has been one hundred years since the Battle of the Somme in WWI, there have been numerous books produced, both fiction and non-fiction that deal with the Royal Newfoundland Regiment and its heavy involvement in the Great War. A Splendid Boy (2016, Flanker Press) by Melanie Martin is a fine example of the type of historical fiction Flanker Press produces.